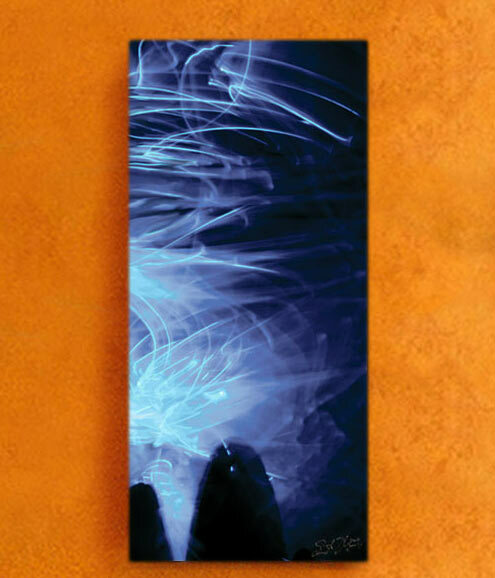 All in Time is an original fine art creation by Stephen Perkins, measuring 40” x 18” in complete image size. 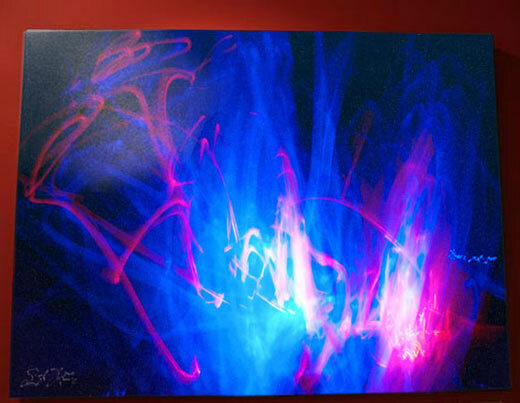 Created for the canvas by Perkins, this art piece is the result of a 60 second drum performance utilizing a flurry of sticks of different colors, temperatures, and widths. 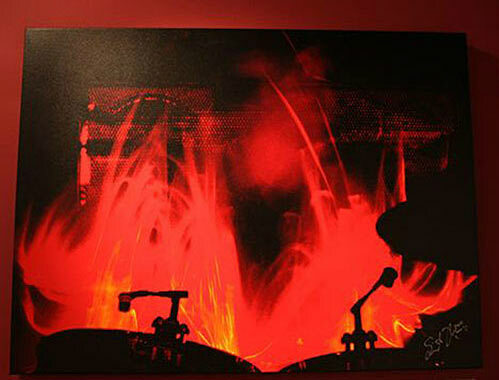 In total, there are 10 canvases of All in Time available worldwide, each numbered and signed by artist Stephen Perkins. 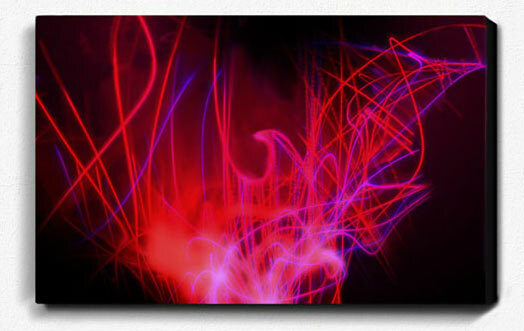 Odd Time by Stephen Perkins is a mystical piece in the collection, measuring 30” x 18” in size. Though abstract in nature, the image presented brings forward distinct imagery to viewers. 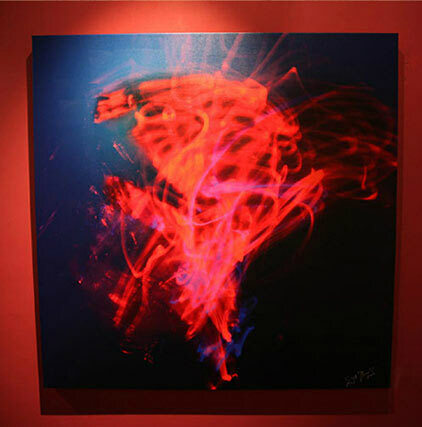 Created by Perkins exclusively for canvas, the performance featured on this piece was created over a 60 second drum performance. In total, there are 10 drafts of Odd Time available only, all numbered and signed by artist Stephen Perkins. Spring Time by Stephen Perkins is a unique visual in the collection. Measuring 40” x 30” on canvas, Spring Time is a simple performance of 30 seconds with Perkins utilizing only 2 colors resulting in a powerful abstract image. Upon viewing, an assortment of images appears to many, from a woman walking forward, to Buddha’s head welcoming in a line of humans making a spiritual transition. In total, there are 10 drafts of Spring Time available only, all numbered and signed by artist Stephen Perkins. 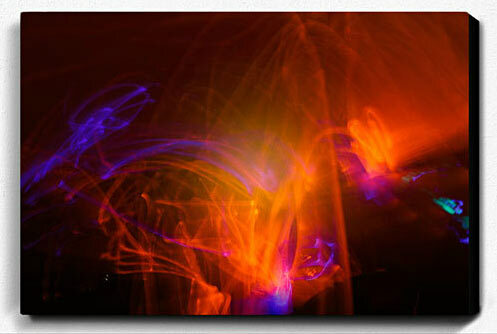 Within a bombastic performance came Night Time by Stephen Perkins. From the performance, viewers will see a dark fog-like mist worthy of exploring. Viewers will note a mountain-top within the image that is actually a cymbal’s shadow. Night Time is a unique addition to Perkin’s fine art debut measuring 18” x 40”. In total there are 10 drafts of Night Time available worldwide, all numbered and signed by Stephen Perkins. The first piece created by Perkins in the series, Bed Time is of another dimension. Measuring 40” x 30” in size and created over a 60 second performance for canvas, this piece originally was previewed at the famed Andrew Weiss Gallery in Beverly Hills to unequivocal praise. 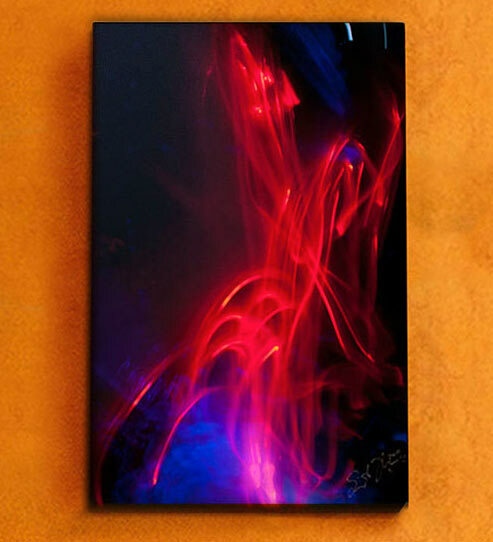 Within the abstract image, viewers saw a variety of images coming forward from the piece, from a Geiger-like alien to a “human torso.” There are 10 drafts of Bed Time available worldwide, all numbered and signed by Stephen Perkins. Arguably the most cryptic in the series, Out of Time calls upon the viewer to see within the abstract nature of the performance. In turn, many will see pronounced visuals coming forward that speak to a meteor shower above a cemetery. A unique aspect of this piece within the collection is the hints of Perkins drum kits that are visible at the bottom of the canvas. In total there are 10 drafts of Out of Time available worldwide. Measuring 40” x 30,” all canvases of Out of Time are numbered and signed by Perkins. Reminiscent of aquatic reflections, Perfect Time by Stephen Perkins is a true study of stick movement. Within the abstract imagery, many see a multitude of faces. 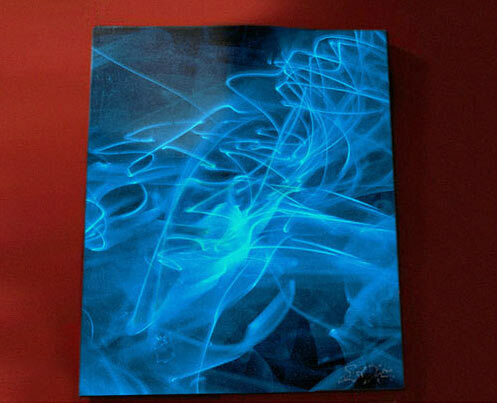 Measuring 30” x 40”, there are a total of 10 canvases of Perfect Time available worldwide. A simple performance for canvas, A Moment In... brings forward many interpretations, most notable an animal crawling up the side of the artwork. Measuring 18” x 30” on canvas, only 10 drafts of A Moment In... exist. Each piece is numbered and signed by Stephen Perkins. Join the interest list to get exclusive information on work and exhibitions from Stephen Perkins.